Inside the new Finder test facility in Merate, Italy. 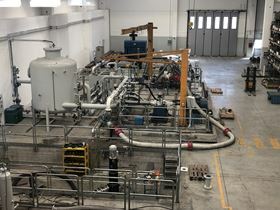 Finder Pompe, part of PSG®, a Dover company, has opened a new pump test facility at its headquarters in Merate, Italy. This investment is driven by the growth in size and complexity of Finder’s pump models, along with expanding customer expectations on pump performance. Finder says that these stricter performance requirements demand more rigorous tests that verify a pump’s capacity, as well as its net positive suction head (NPSH) behaviour, vibration and noise levels, and overall operational efficiency. The facility’s larger footprint makes it more suitable for testing pumps with higher capacities and at higher pressures. Three stiff platforms can accommodate horizontal pump and skid installations. These platforms allow for extremely precise vibration tests, while two independent areas with three tanks that are 13 meters (43 feet) deep have the capability to test vertical pumps with shaft lengths up to 12 meters (40 feet). The facility also has a testing circuit for lube oil pumps and another dedicated to the testing of liquid ring vacuum pumps. This design enables up to four pumps to be tested at the same time. The testing bench features cranes that are capable of lifting pumps that weigh up to 20 tons (20 000 kgs/44 000 pounds). The facility is also capable of producing maximum electrical power of 4 MW. A closed-loop system enables the accurate and reliable NPSH testing with water of both vertical and horizontal pumps.